Due to its ease of collection, saliva is rapidly becoming one of the most used sources of material for genetic analysis. 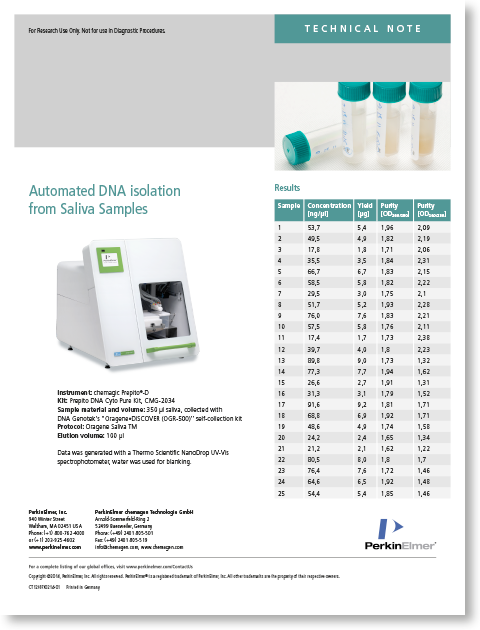 However, the small numbers of cells present in saliva samples compared to blood biopsies is a challenge for the purification of nucleic acids in the amounts required for the downstream assays. The use of the chemagic™ instruments in combination with the chemagic™ Saliva Kits is the ideal solution for the high-throughput isolation of pure DNA and RNA suitable for the most demanding genomic analysis technologies. By exploiting high-affinity magnetic beads, the chemagic ™ technology does not require centrifugation or organic extraction even for samples of large volume, leading to reduced primary sample manipulation and decreased DNA fragmentation.